The Tourism Potential of Jayapura Regency Is Very Promising. Jayapura is a regency in the easternmost part of Indonesia and is the gateway to Papua Province. It has a number of advantages that are quite potential and calculated from the tourism, industry, agriculture, and plantation sectors. The population of Jayapura Regency in 2016 was based on reports from BPS Jayapura Regency as many as 123,780 people with a 2015-2016 population growth rate of 1.95 percent. with an area of ​​± 17,514 Km2 which is divided into 19 Districts 139 Kampung and 5 Sub-districts. Jayapura Regent Mathius Awoitauw revealed, If seen from the plantation sector, its superior products are cocoa and coconut. There are also results from the agricultural sector that are quite potential are Corn, Cassava and Cassava. “Currently we are promoting tourism as a regional superior, because in Jayapura Regency there are many potential destinations that must be developed to improve the welfare of the community, there are natural and cultural tourism that have enough added value that can be considered good and not inferior to destinations- Other tourist destinations in the archipelago, “said Mathius. Speaking of economic potential, Jayapura Regency is one of the gateways of human traffic in Papua. With the average economic growth in the last few years of 10.67 which is above the average of Papua Province (RPJMD, 2013-2017), coupled with the Human Development Index (HDI) figures approaching Indonesia’s HDI, Jayapura Regency has the potential for development in future. The business potential of the regency is among others in the infrastructure, tourism, agriculture, plantation, fishery and mining sectors. In 2015, it even became a district with the highest economic growth in Papua, which amounted to 11.74%. “Jayapura Regency has the Depapre Port, Bongkrang Industrial Area, Sentani Airport under development, the Waibron Industrial Zone and Maribu Industrial Zone which are the points of economic development. 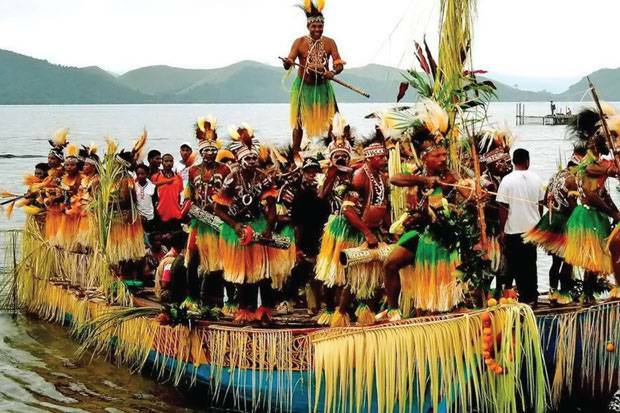 In addition, the district also has Bukisi Beach, Tablanusu Beach, Harlem Beach, and Lake Sentani, including Love Lake which is full of charm, so that it can be used as a strong capital for tourism development, “said Jayapura Regent, Mathius Awoitauw, SE, M.
Jayapura Regency has long been known as a very rich area. Both from natural resources, especially mining and natural beauty that is famous to foreign countries. This was very much realized by the Indonesian government, including the Jayapura district government itself.